The Jotul 373 wood burning stove is purist and functional in its design and opens up new possibilities of how to make use of a stove in a room. What is innovative about the stove is that it can stand free almost anywhere in the room and thus creates a new living room quality. It features a detailed design, unique precision in the cast iron, and can be operated from all sides. 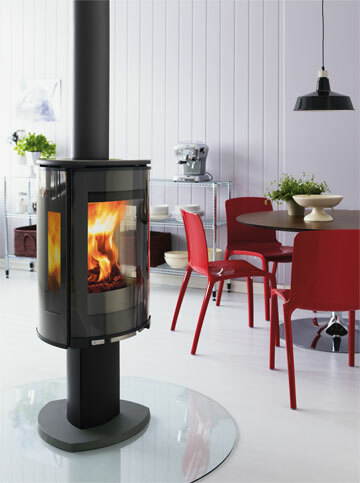 Furthermore, the wood burning stove can be rotated 360 degrees when it is fitted with a flue outlet at the top and with a turntable. In order to adapt to a variety of different interiors, the basic models of the three stoves in this range can be fitted individually and combined with a variety of leg sets. The stoves can also be fitted with an additional glass front panel that lowers the surface temperature on the front. Another unique and well-conceived feature is the decorative panels for the side windows. The panels protect walls and furniture from direct radiant heat and create evocative shadow figures on the walls. In order to give the experience of true open fire, the wood-burning stove has been designed with large glass sides – giving a direct view on the elementary play of the flames. 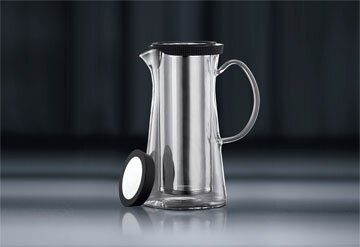 The Bistro jug can be used in three different ways: as a tea jug with a removable stainless steel filter, as a storage vessel for any drinks with the knob sealing the liquid from outside influences, or as a simple glass jug if the lid ring is removed. The whole body of the jug including the handle is made of borosilicate glass interacting with the stainless steel filter through multi-faceted colours: giving the thrilling impression of looking into the eye of an insect. 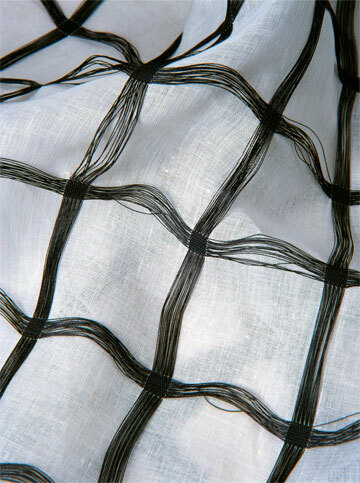 Tela-Baja is a single-coloured decoration fabric with a subtle surface structure. Finest pure linen provides the basis, overlaid with a check pattern, 10 x 10 cm, of strongly twisted, free-floating threads, partly in identical, partly in contrasting colours. The subtle elegance and the simple structure of the fabric belie the demanding manufacturing process. Tela-Baja is pure avantgarde. The KFN 8998 SE fridge-freezer combination defines itself as a luxury-class model, and as such it has been made of high-quality materials and is equipped with reliable and user-friendly technology. Among its main features are, for instance, an external high-precision digital temperature display for the refrigerator and freezer compartments, as well as an automatic ice-cube maker, ensuring that ice-cubes are always on hand for cocktails. In order to complement its understated appearance, the door of this fridge-freezer combination is opened elegantly with the EasyOpen level-type handle. The most exciting design aspect is the lighting of the cabinet interior, a lighting that can well be summarised by the word “entertainment”: In the refrigerator, each individual glass shelf is equipped with maintenance-free LEDs which, thanks to their special design, provide uniform illumination of the entire cabinet. In addition, the door interior of the appliance, the door racks and the zero-degree drawers (PerfectFresh) also feature a special lighting system of equally elegant appearance. 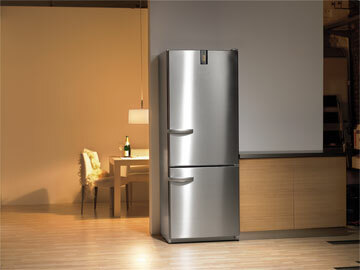 Due to the interpretation of how the fridge-freezer is illuminated, opening this appliance becomes entertainment – its content is virtually celebrated. Miele. One of the tendencies of our current lifestyle is a shift in activities from indoors to outdoors. The Atlantique carpet has been developed for “outdoor cocooning” with a Mediterranean touch. The material is water-repellent, UV-resistant and antibacterial. Made of synthetic fibre, a transparent coating surrounds the coloured core of each fibre string. 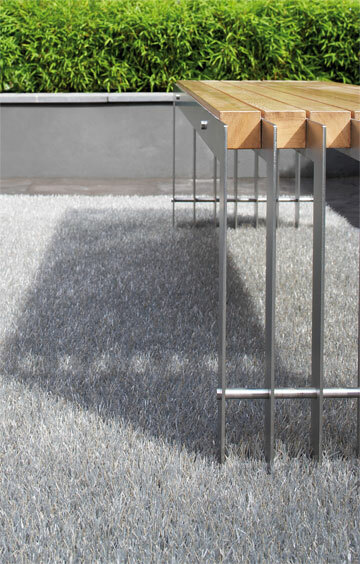 The Atlantique outdoor carpet is available with both cut and uncut pile. The 30-mm cut reflects light and stimulates the sole of the foot. A sober-looking loop pile 16 mm long conveys a rolling impression underfoot. Owing to the softness and elasticity of both cut versions, the pile always reverts to its straight-up position. With these diverse properties, the carpet can be used in pool environments, on terraces, balconies and patios, as well as on boat decks, in wellness centres and professionally used indoor areas. The aXbo sleep phase alarm clock gives the user the feeling of having woken up all by himself. Crucial for its functional design were the latest findings in sleep research. Studies show that we pass through several sleep phases each night, alternating between deep sleep, light sleep and dream phases. Each of these phases is characterised by different body motions. The sleep phase alarm clock uses the activity that occurs in each of these phases. To do so, a motion detection system has been integrated into a comfy terry-cloth wristband, memorising all physical motions and transmitting them to the alarm clock. In this way, the aXbo registers which sleep phase the user is in at any time, and calculates the optimal wake-up moment within 30 minutes of the desired wake-up time. This turns waking up into a gentle experience makes for a smooth and relaxed start to the day. The visual language of the U-Turn fire log storage is both plain and succinct. Open side parts rising up vertically seem to hold the load of firewood with apparent lightness and without bending the shape of the storage. A rotatable base plate allows adjustment of the repository in different individual positions and facilitates easy filling. 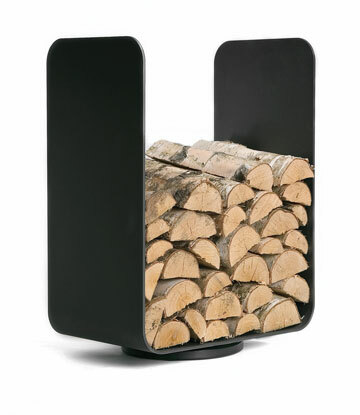 With a volume of more than 80 litres, the U-Turn spares the user a lot of toing and froing to get more firewood.